Back when I volunteered to be a hostess at the local USO during The Big One, I met my first Man-Child in the form of Kay Kyser associate, Ish Kabibble. Now since I was quite a bit older than many of the USO "girls", and with my lumbago and sacroiliac acting up a lot, I didn't dance with servicemen but spent my time chatting with the ones who couldn't dance, like...Ish. I learned a lot about him and found he was not really the Man-Child he appeared to be to audiences. But in reminiscing yesterday over the autographed photo he gave me then, with his iconic haircut, I began to think of the Man-Child syndrome in films. Supposedly the terminology of the Man-Child persona began with the character of Benjy Compson, a character in William Faulkner's novel, "The Sound and the Fury". I will say though this may be the origin of the term, there have been many new developments to the personality type since then particularly on the stage, in vaudeville and in films. This unresearched film tradition shall be the topic of my next book [if I live long enough] to be called "The Man-Child in Film History: Yay or Nay?" Being that the Man-Child in films usually possesses a quite naive and gullible persona, or to be blunt, is often a fool, there are many examples in films, both in comedic and non-comedic roles. My favorite movie Man-Child is Harry Langdon. for the following reasons. His small stature, sad stare and childlike movements fit the bill, yet he brings an extra dimension to such roles with his eerie white face and occasional salacious grins. Though a well known silent star in the '20's in films like "Long Pants" and "Three's a Crowd" his career was derailed some say by people like Frank Capra or possibly Harry himself. Was he a genius or a buffoon? Both sides have their proponents, but one thing is for sure, he definitely fits the role of Man-Child to a "T"! Name your favorite Man-Child character or actor in films. You are welcome to name Woman-Child characters if you can think of any, but apparently there seems to be little gender compliance with this term between the sexes. You are welcome to name Woman-Child characters if you can think of any, but apparently there seems to be little gender compliance with this term between the sexes. 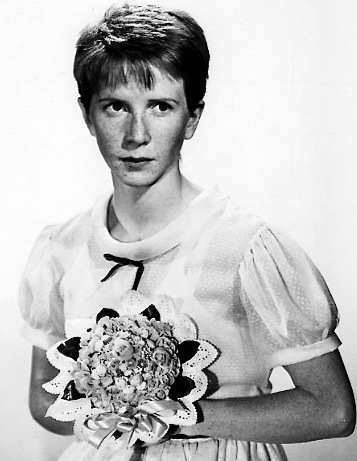 Julie Harris' character in THE MEMBER OF THE WEDDING comes to mind. You may have defied the odds here, TopBilled! 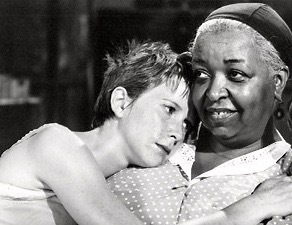 Frankie definitely is childlike and when she keeps forcing people to call her Jasmine, and is mean to poor little Brandon de Wilde and won't even scrape the dirt off her elbows as Ethel Waters tells her too, one thinks maybe she is a Woman-Child. Of course she's not really supposed to be a grown woman yet though, but she might just stay in that immature state into her twenties and beyond, so good call on your part! Postscript: Just got a scare looking at the bottom photo of Frankie. That bouquet looks just like the one for Carlotta that Kim Novak gets in "Vertigo"...yikes! 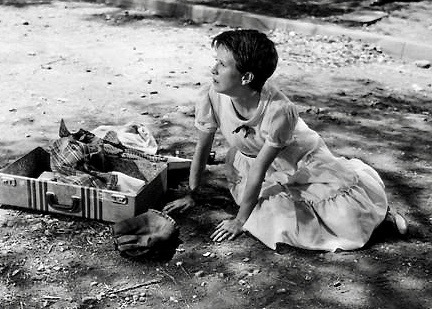 Right on, I think Julie Harris was in her mid-twenties when she played that role, but was quite believable in it as almost prepubescent. Until K.D. 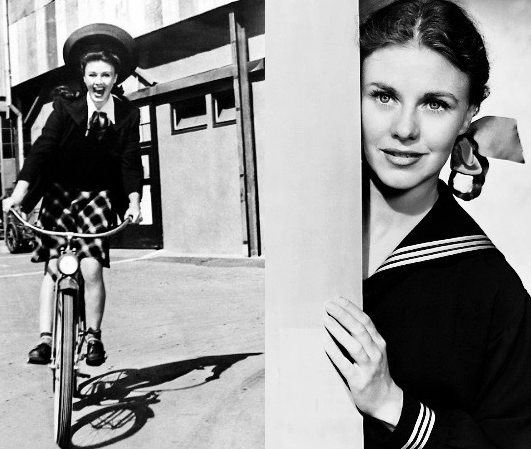 Lang came along, Julie probably held the role of best girl resembling tomboy in show biz. She's always been one of my favorite actresses so thanks for mentioning her. 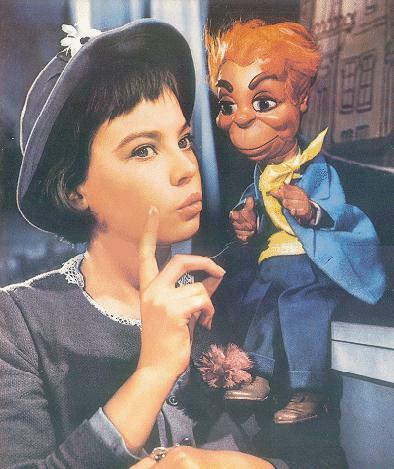 Leslie Caron would probably be one of the shining examples of someone who earned her initial fame as a woman-child. Her roles in An American in Paris, Lili, The Glass Slipper, and Gigi are all very childlike, made even more glaringly so by the fact that she's cast in all four movies with actors who were 10 to 15 years her senior. Another great example is Carroll Baker in Baby Doll. As for man-children, this certainly applies to many a comedian. From Lou Costello and Jerry Lewis to Adam Sandler, many male comedians have built their comic personas on being oversized children. Sissy Spacek is perhaps a less obvious example, but it's interesting that she spent the early part of her career playing characters much younger (or at least younger-seeming) than herself. She was in her twenties when she played a 15-year-old in Badlands, a 17-year-old in Carrie, and 13-year-old Loretta Lynn in the early part of Coal Miner's Daughter. Then there was her strange character in 3 Women, whose age is not revealed but who definitely seems very immature. I wouldn't say that Spacek necessarily looked young for her age, but she was incredibly adept at capturing the mannerisms and insecurities of teenagers in a believable way. As for man-children, this certainly applies to many a comedian. This also applies to some female comedy acts. Lucille Ball's sitcom characters adhered to a woman-child formula. 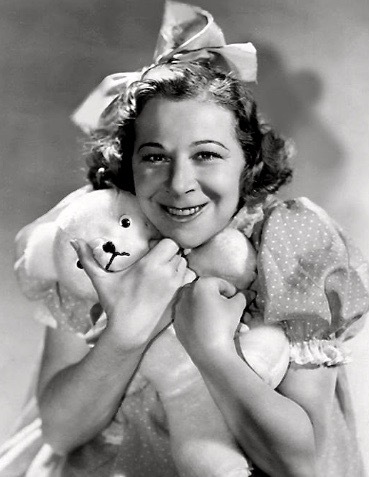 In fact Jess Oppenheimer, who created Lucy Ricardo and Lucy Carmichael, had previously done Fanny Brice's radio show Baby Snooks. So Lucy's antics were obviously inspired by what Brice had done so well. So CG, sorry but I have to ask here. What brought to mind this whole "Man-Child" thing here anyway? As Feego just mentioned, over the years there have been many a Man-Child type comedian in films, but in the field of movie dramas, the first example(s) of both genders that sprang to my mind were the characters Robert Stack and Dorothy Malone played in Written on the Wind. Both of them having been spoiled by their father's wealth. I think the reason that the term "Woman-Child" is not used in general, as Man-Child might be, is due to the fact that just being a bit childish, still can be an appealing trait in an ingenue type way, or waifish role, whereas the term "Man-Child" is a lot more pejorative in the sense of portraying characters who seem feeble-minded, doofy and literally foolish, like in a Jerry Lewis way or perhaps like one of the Stooges. Sandler is definitely a spin-off of the ingrained Man-Child in films role, but people like Caron doesn't have all the pejorative side-traits. But I did ask for possible contestants who were female so am totally enjoying seeing all these feminine parts being mentioned and thanks so much! Sissy did a great rendition of the state of mind of Caril Fugate, on whom the role was patterned. Her romance with the older Starkweather, who did have the James Dean fixation, was well done in Malick's "Badlands". She is more Child-Woman than most in films, and Spacek was good at portraying females of that nature in roles like, was it Pinky, in Altman's "3 Women". Sissy was also wonderful as a youthful Loretta Lynn! Thanks for your post. I don't think there's really a double standard here. There are plenty of examples of the woman-child type. In both situations, the man-child and the woman-child may be presented as unformed or as simpletons, whether it is for dramatic or comedic purposes. Of course it gets exaggerated differently, depending on the genre. In gangster flicks, the ditzy moll is the woman-child. In a sitcom, it might be the daffy elderly woman like Billie Bird in Dear John, Alice Ghostley in Designing Women or Betty White in The Golden Girls. Tarnation, Dargo...didn't ya read my post? I said while routing through my old mementos I found the photo of Ish Kabibble, which naturally brought to mind the Man-Child scenario. Besides I've been banned from all sites titled "Tweets by Twits" on the entire Internet. Robert Stack as the tobacco heir probably is a good choice for a Man-Child in a non-comedic role. I thought for sure you'd be mentioning someone who liked to yell out "Laaaa-Deeeeeee" in films with Dino, so thanks for thinking outside the box! Elisha Cook Jr. is another interesting man-child type, who excelled at playing the wimpy or nervous "kid" type in films throughout the late 30s and early 40s, most notably in The Maltese Falcon. The thing is he was actually in his mid to late 30s at the time. He in fact was six months older than Peter Lorre, but that didn't stop everyone from bossing him around like a child in Maltese. Do you remember when the Beatles first hit the scene and how many of our parents said their hairstyles looked like Ish's from back in their day? Ooooh, I had no idea a conversation about the Man-Child persona could become so heavy and scholarly, TB! 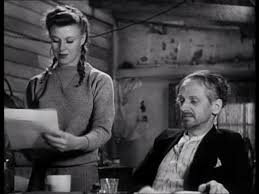 GINGER ROGER'S characterization of Ellie Mae in THE PRIMROSE PATH (1940) is a great example of a young woman acting like a girl to escape her womanliness. I'd like to remember that, but when the British Invasion hit our shores, was the year I had all the cataract problems and also had to get that complete set of dentures, and I missed a lot of those Ed Sullivan shows sadly. I sure always enjoyed when Eddie Boy would speak to Topo Gigio though and have the really good singers on, like Tony Martin and not all those rock and roll acts. Pshaw! GEEEZ, exactly how old ARE you, madam??? If I said I was older than Hermione Gingold, would that mean our engagement is off??? 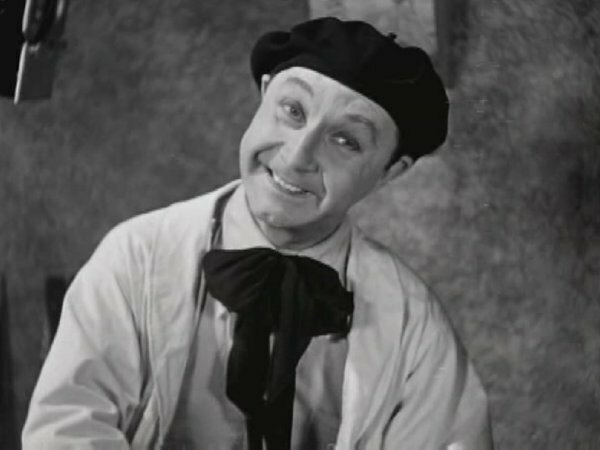 Now that would make me around one-hundred and twenty-two years old and being an ageist and still youthful, you'd probably rather date two women of only sixty-one years of age, wouldn't you, you cad! Very funny, Dargo. You made me LOL. 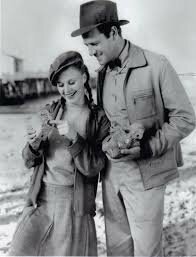 I watched Flaxy Martin last night which I had recorded off TCM when Virginia Mayo had her day in Summer Under the Stars. Zachary Scott's character kept razzing on Elisha Cook's character's youthfulness and this movie was from 1949.